Dec. 4, 2018, 10:52 a.m.
Two years in our industry can be the blink of an eye or half an eternity. While news organizations, business models, and viability can explode in a Facebook Watch flash, consumption habits haven’t changed that drastically — yet. and 19 percent today vs. 17 percent for listening to it, according to new research from Pew. Keep in mind these numbers are cross-generational, from millennials with Alexandria Ocasio-Cortez’s Instant Pot on Instagram Stories to retirees with Fox News in Florida (yes, those are very broad assumptions). Previous Pew data found that six in ten adults age 18-29 watch television now via online streams. 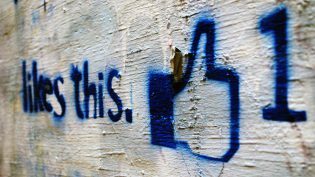 Did Facebook’s faulty data push news publishers to make terrible decisions on video? This comes back to some of the questions about consumer demand for video news. Facebook infamously pushed news publishers toward more video content that ultimately flopped, dragging down businesses who had pinned their hopes in this volatile market that video was the final pivot to make. Pew data from 2016 showed that younger adults prefer news via text, not video — it’s those over age 50 that are in the majority for video. So keep those grains of salt in mind for this study, though it did offer some breakout stats on the youngs and the olds. The trend of younger generations preferring digital over older generations is — don’t hold your breath — continuing. Those over age 50 have increased their comfortability with the web since 2016, but respondents age 18 to 49 are still blazing ahead online. This Pew report encompassed 3,425 U.S. adults surveyed over the summer. Schmidt, Christine. "Americans still prefer watching over reading news (but that’s only because of people 50 and up)." Nieman Journalism Lab. Nieman Foundation for Journalism at Harvard, 4 Dec. 2018. Web. 19 Apr. 2019. Schmidt, Christine. 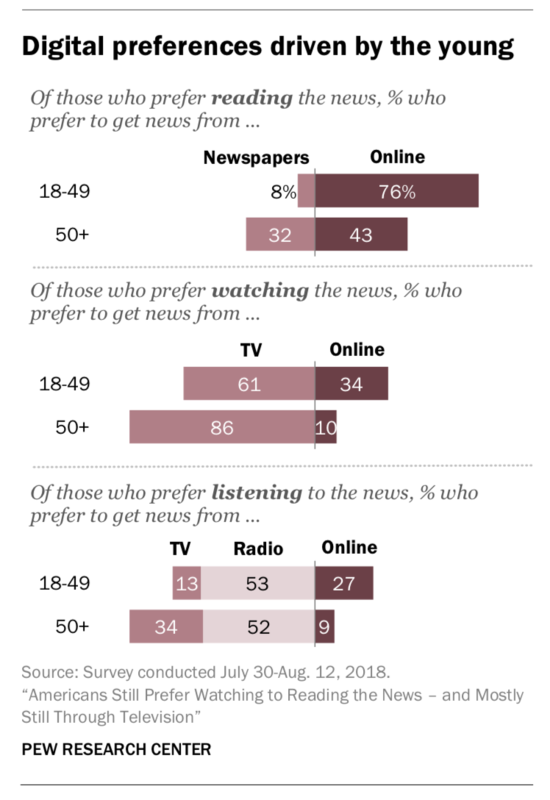 "Americans still prefer watching over reading news (but that’s only because of people 50 and up)." Nieman Journalism Lab. Last modified December 4, 2018. Accessed April 19, 2019. https://www.niemanlab.org/2018/12/americans-still-prefer-watching-over-reading-news-but-thats-only-because-of-people-50-and-up/.